Private Pilot - ​Helicopter Flight Training Inc. The Private Pilot Helicopter Rating is intended for those who want to fly helicopters for personal or business purposes and is also the first step for those who intend to go on to advanced helicopter ratings or who plan to become professional helicopter pilots. 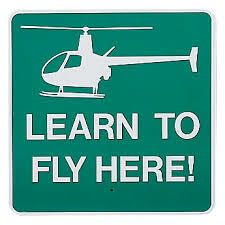 You can begin flight training in the helicopter TODAY! There are NO prior requirements before you begin dual instruction in the helicopter. You can begin at any age, but you must be 16 years old to solo and 17 to earn your Private Pilot's License. NO Prior Airplane or Aircraft Experience is Required to Earn a Helicopter License. One (1) 75 nautical-mile cross-country Solo flight with one (1) 25 nautical-mile "leg"
NOTE: "Dual" Flight Instruction is Flight Time with You and Your Flight Instructor Training in the Helicopter; "Solo" Flight Time is Flight Time with You Flying the Helicopter alone as the Sole Occupant of the Aircraft after Proper Preparation and Training.